People are constantly looking for jobs that are meaningful and pay well. But not only that, the job must be one in which people will not be laid off at a whim. Well, the Drywall and Ceiling Tile Installer is that kind of position. According to the Bureau of Labor Statistics, this position is projected to grow a monumental 29% this decade. Generally, one trained in this position is taught to do both aspects of the job so they can rotate with the other workers. 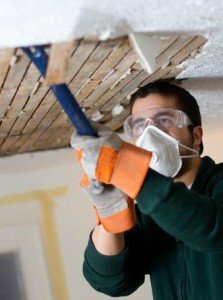 Once wallboards are hung, workers use increasingly wider trowels to spread multiple coats of spackle over cracks, indentations, and any remaining imperfections. Some workers may use a mechanical applicator, a tool that spreads sealing compound on the wall joint while dispensing and setting tape at the same time. To work on ceilings, drywall and ceiling tile installers and tapers may use mechanical lifts or stand on stilts, ladders, or scaffolds. Skilled Drywall and Ceiling Tile Installers may use various means to work on the ceilings. They can use lifts or stand on ladders, scaffolds or even stilts (maybe you can get a job at the circus if you want anothe job change). This job is physically demanding, not because they are out in the elements– they actually work indoors– but most of the day is spent standing, stretching, bending and lifting heavy materials. The dust and dirt in the air can also be an irritant to one’s eyes, skin and lungs so protective gear is a necessity. Most drywall and ceiling tile installers learn their trade through on-the-job training for up to a year. Another option, though, is to become an apprentice for 3 or 4 years. Math Skills – This position uses math skills everyday. They have to be able to estimate the quantity of materials and accurately measure panels for cutting. Brute Strength – One must be able to lift 50 to 100 pounds since these installers often lift heavy materials over their heads to install on the ceiling. Stamina – Working long, hard hours with such strain on one’s muscles and body requires stamina to be able to keep going consistently.